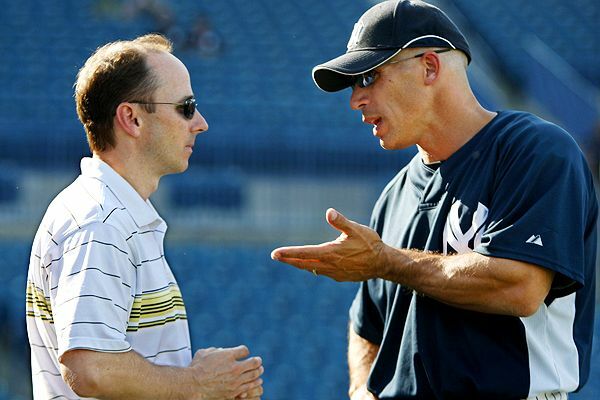 According to a report by the New York Post, it appears that Yankees’ manager Joe Girardi’s job is safe for now. At 13-14 after last night’s 4-3 loss to the Rays, voices in and out of baseball are wondering if Girardi, who is in the second season of a three-year contract, is safe. According to several organizational sources Girardi’s job security isn’t an issue. Too many injuries too early in the season and slow starts by CC Sabathia and Mark Teixeira. And he hasn’t had cleanup hitter Alex Rodriguez play a game, lost Chien-Ming Wang early and Jorge Posada recently. Though Girardi said he understands the attention that comes with managing the Yankees, he said he isn’t fixated on those who blame him for the pedestrian start and being dominated by the Red Sox. “That’s not something I really focus on. I focus on the task at hand. Every day we do the best we can to prepare our club and every move we make is to win the game and that’s what I focus on,” said Girardi, who has been hamstrung by an awful bullpen. As the article notes, Girardi can’t do anything about veterans like Sabathia and Teixeira getting off to slow starts, A-Fraud not being in the lineup and Wang forgetting that he’s not pitching in a home run derby contest every fifth day. Girardi will continue to catch heat because he replaced a manager in Joe Torre who should have never been fired in the first place, and the pressure to succeed will always be bestowed on Yankee managers because of how much the club spends to win. It just comes with the territory. The manager is always on the front lines when a team is losing, but at some point the players are going to have to just step up and freaking produce. Girardi can’t manage situations that are unmanageable (i.e. the pitching staff turning the new Yankee Stadium into Coors Field). With their 7-3 win over their hated rivals on Tuesday night, the Red Sox swept the Yankees for the second time this season and are now 5-0 against the Bombers this season. Jason Bay hit a two-run homer (his seventh of the season) off Yankees’ starter Joba Chamberlain in the first inning to spark Boston’s victory. It’s only May, but it has to be somewhat troubling to the Yankees that they are nothing more than a .500 club at this point after spending as much as they did to fix their pitching staff in the offseason. They currently have the second worst ERA in baseball at 5.86 and opponents are currently batting .277 off them to date. Part of the Yankees’ issues, as they’re finding out, is that they now play in Coors Field Jr. There’s a jet stream in right center at the new Yankee Stadium and opponents are hitting bombs as if the Yankees were hosting the Home Run Derby on a nightly basis. Of course, not having Alex Rodriguez in the lineup has been an issue as well, although he is set to return soon so that all could change. But what has to be most troubling to the Yankees is that they’re just 3-7 against AL East opponents so far this season. And it’s not like they were facing the same red-hot Boston team the past couple days that rattled off 11 straight wins during the month of April; the BoSox had just been abused by Tampa entering their two-game series with New York. Opponents have largely teed off on Josh Beckett and Jon Lester so far this season, yet each had solid outings against a Yankee offense that was supposed to once again be one of the best in baseball. Again, it’s early and once A-Fraud gets back into the lineup the Yankees’ offensive production should pick up again. 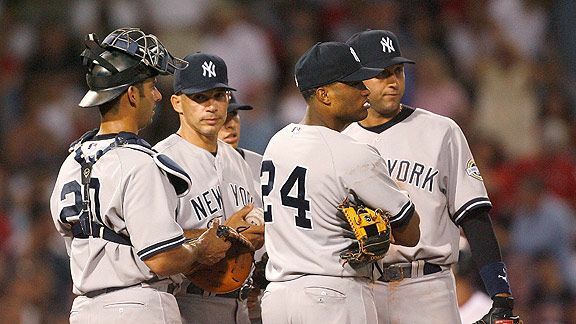 Plus, they have always been relatively slow starters before picking it up around the All-Star break, but Joe Girardi and the rest of the Yankees’ brass can’t feel great that they’re sitting at 13-13 with that payroll and are now 0-5 against the Red Sox.